The Show is Over & the Results are IN! Congratulations to all Winners, nominees and Avi Choice recipients alike. It’s been an honor to celebrate you all. Here we present the top 5 in each category and the Voter’s Choice. Thank you to all today’s performers, presenters, hosts and guests. Thank you to our Sponsors, advertisers, gift bag sponsors and media partners. Most of all thanks to the residents of Second Life who took the time to vote and vote and vote and vote. Here are your top 5 in alphabetical order and the Avi Choice recipients. What Next – Winter Thorn – AVI’S CHOICE! Trompe Loeil- Cory Edo – AVI’S CHOICE! Mudd Puddles – Isa-Blue Jellybelly – AVI’S CHOICE! Trompe Loeil – Cory Edo – AVI’S CHOICE! Fanatik – Kendra Zaurak – AVI’S CHOICE! Meli Imako – Meli Imako – AVI’S CHOICE! Botanical – Kriss Lehmann – AVI’S CHOICE! NevaCrystall Resident – AVI’S CHOICE! Madpea – Kiana Writer – AVI’S CHOICE! Timeless Weddings – Jules Shamrock and Sam55 Dayafter – AVI’S CHOICE! Calas Galadhon Park – Tymus Tenk and Truck Merideth – AVI’S CHOICE! Sanctuary – Stevie Basevi – AVI’S CHOICE! Amatsu Lounge – walterwhiteSr – AVI’S CHOICE! Elysion – Syn Zane – AVI’S CHOICE! Collabor88 – Octagons Yazimoto – AVI’S CHOICE! SeraphimSL – http://seraphimsl.com/ – AVI’S CHOICE! SLUniverse – Cristiano Midnight – AVI’S CHOICE! Strawberry Singh – AVI’S CHOICE! Equine Island Horse Show – A1arica and neternal – AVI’S CHOICE! The Arcade Gacha – Katharine McGinnis – Octagons Yazimoto – AVI’S CHOICE! Christmas @ Calas Galadhon Park – Tymus Tenk and Truck Meredith – AVI’S CHOICE! Hair Fair – Sasy Scarborough – AVI’S CHOICE! KittycatS – Callie Cline – AVI’S CHOICE! The Mesh Shop – Bandit – Sepph – Dutch – AVI’S CHOICE! Azure Islands Estate – Candy Azure – AVI’S CHOICE! Thirsty Camel Gaming Oasis – Firey Camel – AVI’S CHOICE! Zooby – Carrie tatsu – AVI’S CHOICE! Breeders Choice – xTwisted1x Resident – AVI’S CHOICE! KittyCatS! – Callie Cline / KittyCats resident – AVI’S CHOICE! Builder’s Brewery – Sensuous Maximus & Supremius Maximus – AVI’S CHOICE! Abranimations – Abramelin Wolfe – AVI’S CHOICE! Vista Animations – Vista Barnes – AVI’S CHOICE! Vista – Vista Barnes – AVI’S CHOICE! Studio Skye – Alex Bader – AVI’S CHOICE! EarthStones – Abraxxa Anatine – AVI’S CHOICE! Glam Affair – Aida Ewing – AVI’S CHOICE! IZZIE’S – Izzie Button – AVI’S CHOICE! L’Etre – Dam1710 – AVI’S CHOICE! Truth – Truth Hawks – AVI’S CHOICE! Maitreya – Onyx Leshelle – AVI’S CHOICE! CATWA – Catwa Clip – AVI’S CHOICE! Blueberry – Blueberryxx Resident – AVI’S CHOICE! IKON – Ikon Innovia – AVI’S CHOICE! SLINK – Siddean Munro – AVI’S CHOICE! Deadwool – Masa Plympton – AVI’S CHOICE! Letis Tattoo – Leti Hax – AVI’S CHOICE! RealEvil Industries – crashnoww Resident – AVI’S CHOICE! Pure Poison – Shaleene Kenin – AVI’S CHOICE! Aeros – Ray Silent – AVI’S CHOICE! VALE KOER – Bob – AVI’S CHOICE! REIGN – Kenadeecole & illy Miami – AVI’S CHOICE! Erratic – erratic rain – AVI’S CHOICE! Just Because – Annie Melson – AVI’S CHOICE! Blueberry – Blueberryxx – AVI’S CHOICE! Sweet Tot’s – SweetiePie Riggles – AVI’S CHOICE! ::Gabriel:: – Takuya Jinn – AVI’S CHOICE! Hikaru Enimo – AVI’S CHOICE! Seashell Dench – AVI’S CHOICE! IMMORTALS – Isabelle Torok – AVI’S CHOICE! SCALA – Kryptonia Paperdoll and Seashell Dench – AVI’S CHOICE! Purple Poses – Audrey Guter – AVI’S CHOICE! LTD – Love To Decorate – Editorial Clarity – AVI’S CHOICE! Classic Rock 109 – West Habercom – AVI’S CHOICE! Drax Files – Draxtor Despres – AVI’S CHOICE! Bryn Oh – AVI’S CHOICE! The Rose Theater – Kaya Angel – AVI’S CHOICE! Skip Staheli – AVI’S CHOICE! Abranimations Dance HUD – Abramelin Wolfe – AVI’S CHOICE! Moulin Rouge – Xanthia Lisle – AVI’S CHOICE! Bad Ampitude – Vampira Voom – AVI’S CHOICE! Guerilla Burlesque – Chryblnd Scribe – AVI’S CHOICE! Jenna Dirval – AVI’S CHOICE! Rebel Yell Concerts – Lestat Zalivstok and GuiltyAngel Rhapsody – AVI’S CHOICE! Brea Skytower – AVI’S CHOICE! digiSTREAM SHOUTCAST STREAMS – West Habercom – AVI’S CHOICE! Savannah Coronet – AVI’S CHOICE! Maximillion Kleene – AVI’S CHOICE! Noma Falta – AVI’S CHOICE! Samm Qendra – AVI’S CHOICE! The QuadRadiX – Maximillion Kleene, Benude Cleanslate, Sabian Inglewood and Denny Mac (aramanca Resident) – AVI’S CHOICE! Luciano Lionheart – AVI’S CHOICE! Hazel Snowflake – AVI’S CHOICE! Acoustic Cave – MaxPower Godric and Shauna (Kelberry) Godric – AVI’S CHOICE! Big Daddy’s 80’s Club – AVI’S CHOICE! Tril MacLeod (Trilsae Resident) – AVI’S CHOICE! Trader Whiplash – T1 Radio – AVI’S CHOICE! Gabie Meads – AVI’S CHOICE! Bard Wasp – AVI’S CHOICE! The Avi Choice Awards Program will be held on Dec 4th, 2016 at 1pm SLT. This grand finale for the Avi Choice Awards is shaping up to be a fantastic show! The show will be hosted byT1 Radio’s Trader Whiplash and Nuala Maracas. Presenting the SLIFE Awards will be Saffia Widdershins & Elrik Merlin; the FASHION Awards will be Persia Bravin & Frolic Mills and the ARTS Awards will be Jill MacKenzie and LuvofMusic. Performances at this year’s Awards will be brought to you by, fabulous vocalists: Savannah Rain, AleyKat, Christopher Quan and Luciano Lionheart. Dance troupes and choreographers include BabyPeaVonPhoenix Bikergrl, SexyS Quintessa, Diiar Vader Shippe and Royal Shippe and the Monarch Dance Troupe. This year there will be a short pre-show brought to you by the Monarch Dance Troupe, as well. Gift bags will be available in the Variety Hall Lobby for audience members. Dress code at the Avi Choice Awards is formal. The Avi Choice sims will open to the public following the show and all are invited to the Awards After-Party, which is expected to begin at approximately 3:15pm SLT and will be hosted by T1 Radio’s Trader Whiplash & Nuala Maracas. Audience seating will be limited to accommodate approximately 85 audience attendees. Ticket prices will be 400L and seating location will be chosen by the ticket holder on a first come, first served basis. The Avi Choice Awards sims will be closed to the general public and ticket holders will have access to the region that the audience seating is on, at 10 am SLT on the 4th. There will be a cam over viewing area for those who are unable to get a ticket. Access to that viewing area will be by fee payable to a Relay For Life Vendor at the neighboring Xmas Expo! There will be sponsor displays in the lobby area for shopping Thursday the 2nd, Friday the 3rd, as well as lots of shopping at the next door Xmas Expo. While visiting the Avi Choice sims, be sure and visit The American Cancer Society Island adjacent sim. If you are interested in reserving tickets for the Show on Dec 4th, please click the link below and follow the instructions. PLEASE NOTE: Tickets are sold on a first come, first served basis. Some limits may apply. Ticket fees are non-refundable but you may transfer them to someone else, if you are unable to attend. All ticket transfers must be requested up to two hours before showtime. NO tickets will be transferrable after 11am SLT on Dec 4th. Thank you for your interest and support of the Avi Choice Awards. Click HERE to reserve your tickets NOW before they’re gone! AVI CHOICE AWARDS VOTING IS OPEN!! The Avi Choice Awards Voting has begun with opportunities in 3 areas to choose your favorites. Thank you for submitting nominations to the SLife, Fashion and Arts Awards. Voting will close on Nov 28th at 5pm SLT. 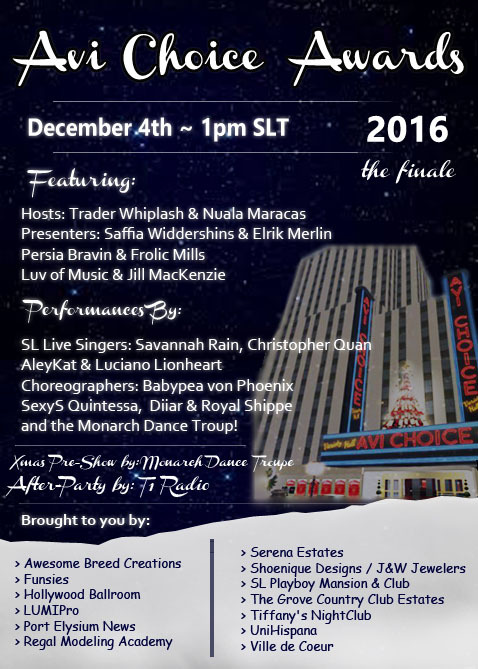 Awards will be presented on Dec 4th at 1pm SLT with a fantastic show. This is our final Awards Show for Avi Choice. We’re busy putting together a spectacular finale that includes Award presentations by Saffia Widdershins, Elrik Merlin, Frolic Mills, Persia Bravin, Luv of Music and Samual Wetherby. Performers include Savannah Rain, AleyKat, Christopher Quan and Luciano Lionheart with choreography by BabyPeaVonPhoenix, SexyQuintessa, Diiar and Royal Shippe. Tickets will be on sale via this website only.. stay tuned for ticket sales date. Thank you to our Premiere Sponsors. Watch for their interviews posted on this website soon! There are still sponsor and advertiser spots available. Please visit HERE if you’d like more information about sponsoring this final Awards Program! Cast your votes now.. Voting ends Nov 28th at 5pm. As always, voting is limited to 1 vote per person, per category. Thank you for joining with us to applaud our favorites in Second Life! We’ve had so many inquiries into the future of the Avi Choice Awards. It has been a full year for the skeleton crew we keep here at the Avi’s and we’ve not been able to keep the site updated, as we should have. As announced during last year’s Avi Choice Fashion Awards, we are retiring the Awards, as we know them. We are talking about continuing our mission forward in some way, but as of this post, we are just in discussion. But for now.. we have an announcement to make! On December 4th, 2016 we will host one more Avi Choice Awards! The GRAND FINALE! This one will take us back to the early days of our Awards when we had one program a year celebrating as many recipients in all three genre’s as we could. Our first category we’ll present will be the SLife Awards who were skipped this past summer. So, this area will have the most categories presented during this winter presentation. After the SLife Awards are presented, there will be presentation of specific categories in the Fashion and Arts categories. We’ll be joined by a wonderful array of Second Life performers, musicians and presenters. There will be some special mentions and moments as we all say our goodbyes to what has become an amazing part of Second Life history. This program will be the conclusion of the Avi Choice Awards, as we know them. It’s been a good run and we could not have done it without support and cooperation and input from the amazing virtual community known as Second Life. Thank you from the bottom of our hearts. Please join us by submitting your nominees for this year’s Awards. Then come back and vote on the finalists and lastly, join us at the Ceremony in December. There will be lots more info coming in future weeks about the program, but for now here are the details around the awards themselves. It’s time for the FINAL Avi Choice Awards Nominations! The nominations have opened for Avi Choice SLife, Arts and Fashion Awards. If you want to submit your favorites to receive an award at this year’s show, now is the time to do it! Follow these links and let us know who you’d like to see put up for vote this year. Take the time to look through each list of categories to determine if you want to submit nominees in each genre. The deadline for Avi Choice nominee submissions is October 12th at 8pm SLT. All nominations are subject to a final consolidating process. The process to narrowing down the nominees to a maximum final 10 will include those who have received a minimum of three nominations from three separate individuals as well as nominations and deliberation by a private panel. Those finalists will then be put up to vote on November 3rd no later than midnight. The number of candidates per category, for voting, will be no more than 10 nominees. Voting WILL be limited to one vote per avatar/resident, per category. The Avi Choice Awards voting will close on November 28th at 3pm SLT. Winners will be announced at the Avi Choice Awards Show on December 4th. The Avi Choice Awards – the Arts Program will be held on Feb 28th, 2016 at 1pm SLT. As announced in December at the Fashion Awards, the Avi Choice Awards are in the midst of it’s final year and the last Awards show for the Arts is shaping up to be an unforgettable and inspiring experience! The show will be hosted byT1 Radio’s Trader Whiplash and Nuala Maracas. Presenting awards will be Samual Wetherby of Showtime Magazine and SecondLife performer LuvofMusic, for the first set of categories and Designing World’s Saffia Widdershins and Elrik Merlin, who are this year’s second set of presenters. Performances at this year’s Arts Awards will be tributes to past and present stars and will bring to the Avi Choice stage, fabulous vocalists: Phil Setner, Viviana Houston and Jeffah. Dance troupes and choreographers include Diiar Vader, Myth Raven, Chrissy Rhiano and Royal Flush (Royal Shippe) of the Rompers Dance Troupe and TersiCorps. Leading us into an amazing finale performance will be a special appearance by Relay For Life’s Stingray Raymaker. Gift bags will be available in the Variety Hall Lobby for audience members. Dress code at the Avi Choice Awards is formal. The Avi Choice sims will open to the public following the show and all are invited to the Awards After-Party, which is expected to begin at approximately 3pm SLT and will feature a full concert by the wonderful performer, Viviana Houston. Audience seating will be limited to accommodate approximately 85 audience attendees. Ticket prices will be 300L and seating location will be chosen by the ticket holder on a first come, first served basis. The Avi Choice Awards sims will be closed to the general public and ticket holders will have access to the region that the audience seating is on, at 10 am SLT on the 28th. Tickets are SOLD OUT ! Voting closes on February 21st, spread the word to those who haven’t voted yet! The nominations and voting results do not reflect the opinions/choices of Avi Choice Awards coordinators or staff members. These were nominated and voted on by website visitors and SL residents in hopes of giving their favorites some appreciation and recognition.. NOT for them to declare who is best. Staff of the Avi Choice Awards are not permitted to nominate or vote on Avi Choice Award candidates. THANK YOU TO OUR PREMIERE SPONSORS! T1 Radio - click to visit their site! Avatar Social Network - Click here to join the social network for Virtual Worlds! SHOWTIME Magazine! Visit their site by clicking HERE! Prim Perfect Magazine - Click to visit the site! Avi Choice Celebrates Relay For Life in Second Life! Visit the website and join THOUSANDS who band together to control cancer. Click on this logo to go to their website! LIKE us on ASN! the Social Network for Avatars! Enter your email address to follow this site and receive news of updates by email.